The thrill of dumpster diving is in the not-knowing. Meal planning is pointless, and you must be open to there being absolutely nothing you want. But since the thing is filled every day, there may be things you take, regardless of the lack of Need. 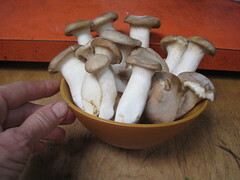 When five pints of these King Trumpets showed up, I knew I’d be making a risotto with the maderized Gruener Veltliner I’d recovered a whole case of in that rainstorm last week……. A resounding success. The bowl here is a bit oval, and I suppose it takes special tools and skill to get a lathe to turn oblongs…the trumpet mushrooms have offset caps, everything in this picture is pleasantly off-camber. ~ by jacquiephelan on March 26, 2011. This kind of reminds me of Fantasia. Was it the Dance of the Mushrooms? Heavvvvyyyyyy.